Just about every kid has experienced the euphoria of spinning around, arms outstretched. The Sufi dervishes harnessed this joyful movement in their ecstatic celebration of and union with the divine. Thanks to Idris Lahore, the art, philosophy, and science of the movements of Samadeva, as they have been taught and practiced by the dervishes in their secret brotherhood since ancient times, are now available to westerners. 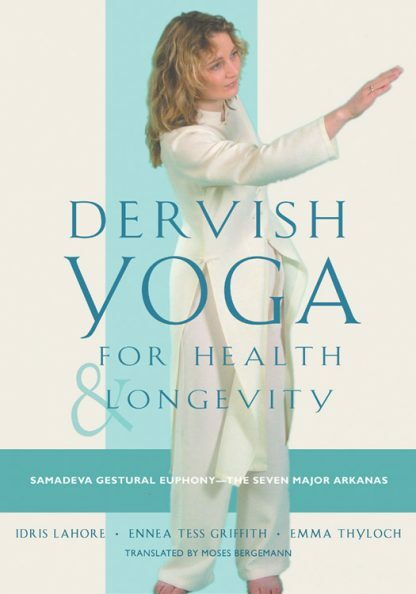 Dervish Yoga for Health and Longevity details the seven fundamental arkana, or sacred exercises, of Samadeva, which are similar to the movements of yoga, T'ai Chi Ch'uan, and dance. The exercises are simple and extraordinarily revitalizing. They rebalance the psyche, slow down the aging process, regenerate the spirit, and fortify the body, bringing it health, energy, suppleness, and harmony. Each arkana corresponds to one of the major energy centers, or chakras, in the body, and the authors include extensive information about each chakra and the effects of the exercises upon them. Illustrated by numerous detailed photographs, these exercises can be easily learned in just ten minutes a day. Use the ancient practice of Samadeva to rebalance, re-center, and revitalize your life! * A new exercise program combining Sufi wisdom with yoga (both Hindu and Taoist), relaxation, eurythmy, dance, and light gymnastics. * Seven exercises for all round fitness in 10 minutes a day. * Includes a special exercise for sexual health . Idris Lahore has been immersed in both Eastern and Western traditions and cultures since his childhood. A painter, poet, and prolific author, he is also a great observer and discoverer. He resides in Alsace, France. Ennea Tess Griffith has practiced numerous psychocorporal techniques since her earliest youth, including such Eastern techniques as yoga, Tai Chi Ch'an, Qi Gong, and Samadeva Gestural Euphony as well as Western techniques such as stretching, eurythmy, and Bothmer gymnastics. Emma Thyloch has taught several courses and seminars in Samadeva Gestural Euphony, Nadi yoga, and Gurdjieff dances and movements for over ten years. She also teaches training courses in Suphonic and Energetic massage.